I did this challenge last year and had fun. I did finish at the end of the summer, but am going to choose the same level anyway. The level increased so that is incentive enough to stay there. See you at base camp! Glad you'll be climbing with me again this year, Freda! Good luck with the challenge! 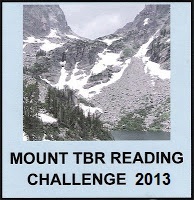 I've never done a reading challenge before. Pike's Peak seems doable.